"Six of us went down into the pit. Only one crawled out. I am Eris, the last. I have seen what the Hive call a god." Eris Morn is a Hunter and member of the Hidden who serves the Vanguard as their expert on Hive lore. She is the sole survivor of the ill-fated fireteam led by herself and Eriana-3 that attempted to assassinate Crota after The Great Disaster. After guiding The Guardian on the path to Crota's destruction, she helped coordinate the fight against Oryx, the Taken King while maintaining secret alliances with Queen Mara Sov of the Reef and the exiled Warlock Osiris. During the Age of Triumph Eris left The Last City to gather more information on future Hive threats. In her first life, the woman who would be reborn as the Guardian Eris was named Erisia Pyatova-Hsien. She lived in St. Petersburg, Russia in the 22nd century, during the Golden Age. She was a skilled swimmer, and enjoyed swimming in the Neva River during her youth and adulthood. In her late thirties, she died during an ill-advised and unassisted winter swim across the Neva. Eris participated in the Great Ahamkara Hunt, and fought an army of Ahamkara on Venus alongside Ikora Rey. Standing amid the bones of the slain wish-dragons, Eris claimed to hear voices that told her of her life before becoming a Guardian. She and Ikora summoned a storm of Light that vaporized the bones, but the voices persisted. Eris would secretly keep one Ahamkara bone with her as a talisman after the Hunt was ended. Following the Vanguard's failed attempt to reclaim the Moon from the Hive during The Great Disaster, Eris met with the Praxic Warlock Eriana-3. Together, they sought to discover a way to kill the Hive Prince Crota, Son of Oryx, who led the Hive on the Moon and was responsible for the deaths of thousands of Guardians. 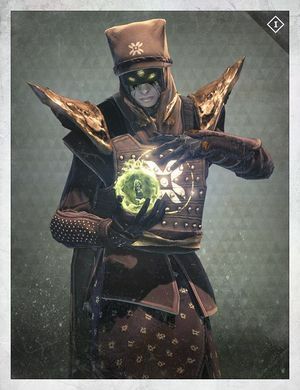 When their own research brought no answers, they sought out Toland, the Shattered, an exiled Warlock who was said to be insane but had unmatched knowledge of the Hive. From him, they learned that Crota could be killed for good if they entered the Ascendant Realm and slew him in his throne room. Armed with this knowledge, Eris, Eriana, and Toland recruited three more Guardians for their mission: the Titan Vell Tarlowe and the Hunters Omar Agah and Sai Mota. Eris began to learn Hive lore from Toland, who explained how when Crota's will was challenged, he would unleash Ogres known as the Might of Crota. She questioned if he had learned this knowledge from The Speaker, but Toland claimed to have received it from the Darkness itself. After landing on the Moon, the fireteam began to walk towards the Temple of Crota while questioning Toland about the Hive champions they would be facing. As they discussed the thousands of Guardians killed by the Blades of Crota and others like them, Eris worried that Light would not be enough for them to emerge victorious. Eriana told her that they could just take the blades of their foes and use those to cut them down if necessary. Eris was deeply concerned about using a weapon of the Darkness to fight their enemies, and Eriana claimed she would do anything for vengeance. Eris told her friend that she prayed it would not have to come to that. When Vell commented that he wished to kill Sardon and the Swarm Princes, Eris reminded him that their mission was to kill Crota, but Toland told her that the Hive Prince's lieutenants were extensions of him. Vell reassured her he had faith in all their Light, but Eris did not believe that faith would help and told him that they had no time for individual battles and must fight together as a unit. Inside the Temple of Crota the Fireteam heard screams from deep in the Hive tunnels. Toland told them the screams came from Omnigul, Will of Crota, and that they signified the birth of new spawn in the service of Crota and that if they killed her, Crota's threat in the physical world would be ended. Eris declared that they would follow her screams deeper into the tunnels. As they descended, the fireteam suffered their first casualty: Vell was overwhelmed and killed by Thrall. Eris, Omar, and Toland were separated from Eriana and Sai soon after Vell's demise. As they moved through the tunnels, Eris told them that she would feel something watching them. Toland explained that those were Crota's eyes, leading the Guardians to be sacrificed in order to wake Crota by draining their Light. Eris berated him for holding onto his secrets like weapons and asked if he meant to damn them all. Toland told his secrets were weapons and that they could use them to complete their mission, directing her and Omar to hunt the Eyes of Crota, kill them, and then follow their draining Light to where Crota waited. This plan also failed, and Eris was separated from Toland and believed Omar to be dead after another encounter with the Hive. As she skulked in the shadows of the tunnels to avoid the Hive, she heard screams from below and followed them into the darkest chambers of the Hive, where she saw that Omar had been captured by a Wizard called the Heart of Crota. Eris watched in horror as the Wizard flayed the Light from her fellow Hunter and used it to feed newly spawned Thrall. With the rest of the fireteam dead and her own Ghost drained of Light and eventually perishing as well, Eris was left alone in the depths of the Hive's warrens. Against all odds, she managed to survive in the Hellmouth's shadowy warrens for years using their own dark tactics against them, despite her previous concerns about wielding weapons of Darkness. She lost her eyes to the Hive, but replaced them with those of a Hive enemy, third eye included. Eris learned much about the Hive, its hierarchy, and how to wield some of their magic. She also had access to a copy of Toland's journal, which aided her greatly in her staying alive in the warrens and expanding her knowledge of the Hive. "My role among the Hidden is an honor." "None would argue. But it's had its cost. Your place is to gather the understanding we need to wage these wars, but your own war is long done. Let those prepared to fight, fight." "None who walk these Towers is afraid..."
Eris eventually escaped the Hellmouth and returned to the Last City alive, but vastly changed by the experience. Her continued obsession with defeating Crota and newfound knowledge of the Hive made her a pariah back at the Tower, but though the Speaker and Commander Zavala believed her fascination with Hive lore unhealthy and made her untrustworthy, Ikora Rey secretly employed her as a member of the Hidden to infiltrate and keep watch on the activities of the Darkness. Though she worked for Ikora, she also conspired with Osiris and Queen Mara Sov of the Reef. Eventually Eris informed Ikora that the Hive were becoming more active, and that Omnigul had left the Hellmouth. She was concerned that the Hive was targeting the warmind Rasputin in the Cosmodrome, and that if such a being was twisted by the Hive all would be lost. Ikora asked her to remain at the Tower to aid in the battle against the Hive and promised to convince the other Vanguard leaders to listen to Eris, while also promising to find Guardians to aid her. "Crota's soul is banished. You have given me the gift of vengeance. I thank you... and even if they don't know it yet... The City thanks you." After learning of a newly risen Guardian who raided The World's Grave on behalf of the Speaker, Eris summoned the Guardian. She declared the Speaker a fool for not seeing that the true threat was Crota and for clinging to his belief in a dead god, and tasked the Guardian with slaying the Swarm Princes and destroying the Sword of Crota, which the Vanguard mistakenly believed had been destroyed long ago. After they succeeded, Eris requested they kill Sardon, Fist of Crota, who was leading the Hive in the Cosmodrome in preparation for the revival of Crota's soul. As they hunted Crota's general, Eris explained to the Guardian Sardon's role in conquering the Moon and how she survived for years in the Hive's warrens there. The Guardian defeated Sardon, but Omnigul was spotted in the Cosmodrome as well, and Eris requested that the Guardian return to the Tower to discuss their next step. Eris learned that Omnigul was targeting Rasputin, proving her previous concerns about the Hive's plans correct. She sent the Guardian to stop Omnigul from destroying or corrupting the warmind, which would allow the Hive to invade Earth without worrying about Rasputin's defenses. Eris was surprised when Rasputin allowed access to his bunker, and was shocked to discover Omnigul had already found a way inside. The Guardian stopped Crota's mate, who fled to safety, and Eris noted that the Hive on Earth were more powerful than she had assumed. She summoned the Guardian back to the Tower to discuss how they would stop the Hive from waking Crota's soul. Despite this victory, Eris was concerned about why Omnigul fled, as she usually feasted on Light, and feared that she may have found what she was looking for in the bunker. Eris was also cautious of Rasputin's motives and wondered if its survival of the Collapse came at some cost to humanity. With Rasputin safe, Eris tasked the Guardian with going to the Temple of Crota and stopping the Wakers of Crota from beginning a ritual to restore Crota's soul. When the Guardian arrived, they discovered that the ritual had already begun, and Eris desperately urged them onward to stop it from being completed. After the Guardian destroyed the Wakers, Eris directed them to destroy the crystal that the Wizards were using for the ritual. Once it was destroyed she thanked the Guardian for banishing Crota's soul and bringing her some measure of vengeance for her fallen friends. With Crota's soul banished, Eris declared that Omnigul now had to die in order to truly ensure that Crota could not return to the world. She had located Omnigul in the Skywatch, where she was creating a new Hive army to carry out Crota's will. Once the Guardian slew Omnigul, Eris thanked them and hoped that her friends would now find some measure of peace. She rewarded the Guardian with the Fusion Rifle Murmur. She also explained that many of Crota's disciples still walked the Moon and Earth, and suggested they find a way to enter the Hellmouth and find a way to destroy Crota for good. Eventually, the Guardian also killed Crota, venturing into the Ascendant Realm and slaying him at his Oversoul Throne. With Crota's death, Eris turned her attention to his master and father, Oryx, and for this purpose she turned to Queen Mara Sov of the Reef and the exiled Warlock Osiris for help. The three met in the Queen's throne room in the Reef, where Eris declared that she had no wish to play any games of politics with them and was only there to ensure a united front met Oryx when he invaded the system. The Queen agreed with her, and the three began plotting to end the Taken King. She kept her alliance with the Queen and Osiris secret from the City's leadership. During the Wolf Rebellion she secretly met with Prince Uldren Sov at the Vestian Outpost, avoiding the other Guardians who were now allowed into the Reef. She informed Uldren that she had news from the beyond that the Queen needed to hear. Together they formed a plan to defeat Oryx; the Awoken would prevent his fleet from entering the inner system, while Eris would help the Guardians enter the Dreadnaught and defeat Oryx. She is one of the guides in The Taken King, and among the first to detect the threat of the Taken. Cayde-6 liked to refer to her as his "creepy sidekick" in their efforts to stop Oryx, much to her immense annoyance. When Eris found out that her ship was destroyed in Cayde's mission to board the Dreadnaught, she is enraged at Cayde for the loss. Despite her anger, she still worked with him to help bring down Oryx. However, once Oryx is defeated permanently, she refused to let go of her anger. After the Taken King's defeat, Eris aided the Guardians in slaying would-be contenders and pretenders to Oryx's throne. Chief among them were Alak-Hul and Malok. In regards to the Darkblade, she hoped to gain a sense of vengeance as Alak-Hul was present during her old teams raid against Crota and caused some of their deaths. She also knew that Alak-Hul could nonetheless make a worthy successor to Oryx and thus he has to be taken out from within his prison. Guiding the Guardians to the prisons within the Dreadnaught, Eris leads them to Alak-Hul's black cell and after a tensing battle, they succeed in slaying the Darkblade. Malok, Pride of Oryx, attempted to assume Oryx's place by taking over the Taken with his mastery of the Blights and lead an all-out assault on the Last City. However, thanks to Eris's guidance and tips from Variks, the Guardians drive Malok out of the Dreadnaught to the Shrine of Oryx on the Moon. There, the Guardians slay the would-be contender to the Osmium Throne. During the Festival of the Lost, Eris was approached by Cayde-6 and told him to leave if he did not have a replacement ship for her. Cayde attempted to get her into a more festive mood, but Eris dismissed him by listing all that she had lost, including her friends, her Ghost, and her ship. He offered her a sweet treat from a smuggled package that Kadi 55-30 had confiscated, which Eris refused and bid him once more to begone until he had a new ship. Eris reluctantly assisted Eva Levante in decorating the Tower during the Dawning. Eris viewed the festival as trivial and a waste of time while the servants of the Darkness still lingered. Eva attempted to convince her that joy and hope was important in fighting the Darkness, but Eris viewed it all as pretending. Eva stated only joyful Guardians could defeat the Darkness, and that holding the Dawning festival was her way of making that happen, causing Eris to wish her a happy Dawning. Shortly after the Dawning, Eris visited an old friend in the hospital, a Warlock by the name Asher Mir. She spoke to his catatonic body, telling him her time in the City was over, as she had accomplished all she set out to do there. She decided to find a new way to eliminate the Hive, and that she could not find it within the City's walls. Before leaving, she spoke a grim warning; that a "storm" was coming, and she would not be with them when it broke. This storm would end up becoming the Red Legion assault on the City and the beginnings of the Red War. Eris's departure is noted by the Vanguard and the Guardians, as they originally hoped to ask her for advice on the new Hive broods encountered on Titan. However, Zavala states that no one has seen or heard from Eris since before the Last City fell. After the Traveler's reawakening and the liberation of the Last City, there was still no news of Eris. At some point following her departure, Eris sends a message to Asher Mir, stating that she has built a ship out of Hive Chitin and discovered a throne world created in the Ascendant realm built for a being aligned with the Light. "You saved us all. Your sacrifice—"
"I am still here. My sacrifice was—"
"And I should ask new heroes to fall... as they did?" "It is why we were reborn in the Light."" Secretive, vengeful, quiet and heavily somber, Eris Morn exemplifies nearly every trait of a hardened and scarred survivor. Though it is largely unknown what type of person Eris was before the mission in the Hellmouth, she was no doubt a loyal teammate to her fellow Guardians. However, following her experiences deep within Crota's domain and the tragic loss of her friends at the hands of the Hive Prince have left Eris bitter, hardened and dark. Since emerging from the Hellmouth, Eris became obsessively determined to achieve vengeance in the name of her fallen friends, striving to take down the Hive as a whole. Despite still being loyal to the Last City following her traumatic experience, denizens of the Tower are often uncomfortable with her dark moods, with the Speaker and Zavala often finding her foreboding warnings of the Hive to be a sickness. Likewise, Eris does not see the value or point of the Last City's holidays and traditions such as The Dawning and the Festival of the Lost. Ikora, however, continued to show support and faith in Eris, which led to her becoming a member of the Warlock Vanguard's Hidden. Cayde-6, on the other hand, often makes comedic jabs at Eris, especially when they worked together during the Taken War, which Eris did not exactly appreciate. Thus, she heavily scorned the Hunter Vanguard. The only member of the Tower, whom she maintained a true friendship was with the Gensym Scribe, Asher Mir, finding kindred spirits in each other due to the changing experiences they have had at the hands of aliens. In regards to the Guardian, Eris showed respect for their efforts in protecting the Last City and gratitude for listening to her warnings. She was especially grateful for their actions in slaying Crota and Oryx, granting her vengeance for the friends she lost. However, she warns the Guardian not to grow accustomed to their victories, for she always (and rightly) believed that a greater threat would be waiting and must be prepared. Even though Eris possesses an unending hatred for the Hive who took everything from her, she has become one of the Last City's foremost experts on the Hive, second to or even rivaling Toland, the Shattered, bearing in-depth knowledge on their practices, powers, deities and intentions. The Guardian and Ghost appreciate her knowledge on the Hive, as it saved their lives multiple times and aided them in defeating their enemies. Most uniquely, Eris bears strong connections to powerful and legendary figures in the Solar System, namely Queen Mara Sov and Osiris. For an unknown time, she maintained a level of communication with the exiled warlock. With Mara Sov however, Eris possessed a level of trust and respect with the Reef Queen, having full knowledge of her plans in the Battle of Saturn and what needed to be done to achieve victory against Oryx. Further, she relayed her findings in creating Throne Worlds to Mara and what information she had on Savathûn, the Witch-Queen. Players must speak to Eris to unlock the Story Missions and Will of Crota strike in The Dark Below, as she is the story agent for the expansion. Besides offering quests, Eris offers her own bounties and has her own reputation stat. She sells unique shaders, emblems, class items, and a few upgrade materials specific to the expansion. When The Dark Below is obtained, Eris will hand over a quest line called the Rise of Crota. After completing the quest and its missions, Eris will award you with the legendary fusion rifle Murmur. Eris will give you two quest lines, The Extermination and the Urn of Sacrifice. The Extermination will award you with the Mark of the Duskborn, Cloak of the Dusktorn, or "Curse of the Hidden" depending on your class. The Urn of Sacrifice will award you with Knightbone Guard, Acolyte Rung, or Thrallskin Brace depending on your class. Available items for purchase depends on what level of reputation the player has with her. Unlike many other vendors, she sells upgrade materials and ammo synthesis in exchange for Black Wax Idols. "One little, two little, three little Hive. You killed so many, now none are alive." "His father won't forgive us for this... Oryx will come for us." "My eyes I was born with are down in that pit buried with the Guardian that I once was." "We are bonded forever Guardian." "You delivered us all from my suffering." "You must tell me how Crota looked as he died." "Be vigilant, listen for the name Oryx." "The Guardians who fell can sleep now, thanks to you." "They took my Light, I took their eyes." "I felt it the moment Crota died." "Now you know my suffering." "So many years lost but it was all worthwhile." "I wish I could have been there to witness Crota's fall." "There is nothing you can't do now Guardian." "The Temple of Crota rages at your offense Guardian, rages at your light." "She still listens, I've told her what you've done." "Go! Haunt them! As they haunted me!" "What have they done to you? What horrors have you seen?" "The abominations protect what they value." "The father remains, we will need you again." "You finished what we started." "Have you faced the Swarm?" "The Spawn of Crota. Have you seen them?" "I never hoped. I never dared to dream that Crota could be killed." "In you, Guardian, I have found redemption." "Yes, I can tell that you have been tested... Now things will become interesting." "The eyes I ripped from them can see further than the eyes that I lost, the visions haunt me." "When the Hive took my eyes, I took theirs in return." "I wonder, do the Hive fear your Light?" "The emerald flame, I can still feel its heat." "His wrath could end worlds, but his father... I cannot imagine his wrath... The stars will weep." "What if the Prince had Brothers? Sisters? I never considered that." "An eye for an eye you see? They took one, but I took three." "The city sleeps Guardian, the Hive do not." "You haven't seen Darkness... Not yet." "The City's walls are not shelter, they are a mask to cover our fear." "They took my light... I took their eyes." "The third eye sees more keen in the dark." "In the end I spent more years with the Hive than the Guardians I fought with." "I was right... I was right all along... I wasn't mad." "With its dying breath, the Traveler created Ghosts... to open doors." "All things are possible now." "How long has it been since I lost her?" "I hope the Speaker knows what you've done." "I never believed it could be done." "I thought we'd lost you." "I wish I weren't the only one left to see what you've done." "Ikora understands. She's the only one who understands. Without her, I'd be alone." "It gets better. You get used to the pain." "It will soon be over. One way or another." "No one else can do what must be done." "Omnigul is dead, the Will is broken." "Such a brave light. Prepare yourself for what comes next." "Tell everyone: if you aren't hunting Crota, you're just killing time until he gets here." "The soul is banished, but Crota still lives." "You honor the names of those who fell." "You've defeated his Will, but the body remains." "How long have the Hive been on our Moon? No time according to their standards. Imagine the kings of their worlds." "I am bidden to grant you dried fruit candies." "Am I supposed to celebrate death? It's a time of mourning our lost, yet everyone is... smiling. Candy will not save you! Sugar is a fickle friend. People say I am disturbing." (sighs) "Happy Festival of the Lost, I suppose." Eris is the goddess of discord in Greek mythology. During the Festival of the Lost, Eris gives the player the item Tiny Box of Raisins, instead of the candy given by all other vendors. The raisins seemed useless and could only be discarded. As of update 2.4.1 they became Ascendant Raisins and grant a Grimoire card to those who still have them. In their place the player is given Piece of Celery. Her past and experiences with the Hive, mirror that of the Fallen Scorn Baron, Hiraks, the Mindbender, as he survived the Hellmouth as a Dreg and emerged changed. However, where Eris desired vengeance on the Hive, Hiraks grew obsessed with them and their powers. Closeup of Eris Morn's face. Concept art of Eris Morn. Front and back views of Eris Morn. ↑ data.destinysets.comIs it you?, Will you smile?, Medusa, Thetis Brave, act|choose|react, Injection, Thank you, YOU MUST, react|choose|act, asudeM, It's just me.